Summary: Most of the work this week was in the cockpit. We stripped off the top layer of fiberglass for most of the cockpit floor, ground back the gelcoat, dug out the old balsa coring, replaced it with structural foam, and glassed it over in 3 separate places: under the cockpit table and on both sides of the cockpit. 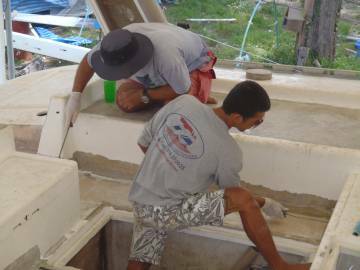 We also opened up the steps going down to the companionway, chasing down rotten balsa coring. This work is still ongoing, but we're hopeful that we're nearing the end of the surgery. 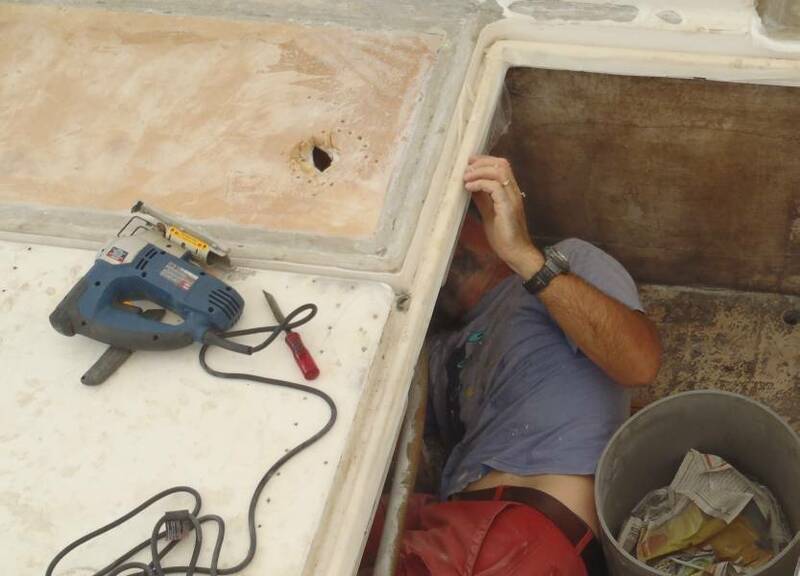 Jon started cutting cores out where the deck hardware (winches and such) bolt through the cabin‑top, so we can reinforce those areas where bolts go through the coring. In the woodshop, Houa finished repairing those floorboards that needed it, and many of the floorboards got several layers of varnish. Those that got repaired also had the wood tinted to match our existing wood. The guys actually came in on Sunday to work on the area under the cockpit table. They stripped out all the old balsa, laid down a sheet of biaxial glass in the bottom, put a piece of foam on top of that, put a thin sheet of plastic over the foam and then put weights on top to hold it down. The plastic was the wrong sort (vinyl?) so it stuck to the epoxy, but not badly. They seem to think that all plastic sheeting is the same. We'll have to tell them about the joys of polyethylene, and how it's different from other plastics. They also put too much weight on the foam so it bent down in the middle, but that's easy to fix. So today Max and Boy got all dressed up in protective clothing and got out their grinders. They cut lines about 1.5" (3cm) in from the lip where the teak ended and cut there. 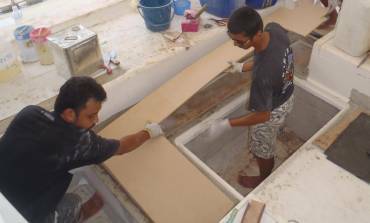 We wanted to have some fiberglass to bond too. They also ground down the lips that surround the depressions and form the edge of the teak will go. Golf will have to put those lips back, but they're just gelcoat. We would have a difficult time putting them back, but it seems pretty easy for Golf and his crew. Max and Boy finished perhaps 60% of the grinding in the cockpit, so presumably it will continue tomorrow. A good time to be somewhere else, but they do need direction now and then, so we can't be too far away so we usually go sit down at our lunch spot by Ao Chalong Bay. There's a nice shade tree, nice chairs to sit on, and always a nice breeze blowing from the water. In the woodshop, Houa is repairing some of our damaged floorboards. He's gluing in matching teak veneer when necessary. One floorboard he's completely rebuilding out of teak and ash (instead of holly, but it looks almost identical). The undamaged floorboards are getting sanded and varnished. They're already looking very nice, but we can't put them in until all the work is finished, or the workers dirty feet will damage them. Before the grinding got too bad, Jon tried an experiment. Since all of the bolts go through the balsa coring, we have to drill them all out, fill them with epoxy mud, and glass them up so we can re‑drill the holes through the epoxy mud and keep the balsa sealed up. So far, we've had to drill through (or take off) the front layers of fiberglass when we drill out the holes. But for some holes we now have access to the back, so Jon tried drilling out the holes from the back. The glass at the back is usually thinner so easier to go through, and doing it from the back means no cosmetic repairs afterwards. Jon tried this on some holes in the cockpit, and will probably continue with the bolt‑holes for the 4 winches, the 2 spin‑locks, and possibly even the sail‑tracks as well once the air is clear of fiberglass dust from all the grinding. Golf had warned us that the morning was going to be taken up with "gliding", his word for grinding, so we stayed away for the morning. When we got to Ocelot, it was quickly apparent that the "gliding" would go on all day. We're beginning to believe that Max won't be happy until Ocelot's nothing more than a pile of dust! Work today centered on grinding back the gelcoat in the cockpit around the edges of the fiberglass deck patches that they're going to take off. This is to provide some good fiberglass for the new glass to grab onto when we lay it down. But Max also found that much of the fiberglass on the step down to the Ocelot's entryway was delaminated and coming away from the (soaking wet) balsa underneath. This area probably gets more water than any other, because this is where we usually shower. So he had to cut back more fiberglass than we were originally planning. This is an area that we'll need to repair quickly, as we can't really get inside Ocelot to do other work until that step is usable. In the woodshop, Houa was working on some of our teak‑&‑holly floorboards. A couple of them have gotten too damaged over the years, so he's replacing the teak with new veneer, and replacing the holly with ash, a similarly colored white wood. Houa really is an artist, gluing new teak veneer down, then routing out a groove for the ash and epoxying it in before sanding it flush. Most of Ocelot's floorboards have had at least 1 coat of new varnish now. 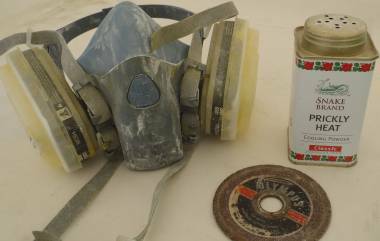 A woodworker was sanding them lightly to receive additional coats of varnish. Two steps forward, one step back. My oh my, that balsa's black! Water entered down those screws, giving us the Balsa Blues. Yep. The deconstruction of our lovely Ocelot continues as we uncover more crimes against balsa in the cockpit floor and sidewalls under the helm seat. We can't proceed with laying new teak over old problem areas, so we're facing more time and money to replace the cockpit balsa with structural foam and new fiberglass layers. 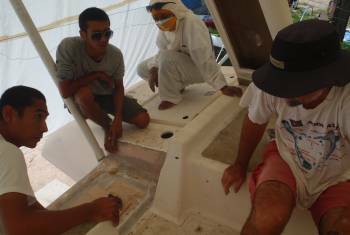 We stayed away all morning again, thinking that both Max and Boy were in their white coveralls and wrapped heads, grinding away at the fiberglass on the aft deck and cockpit. When they do that, there is nowhere to escape to, except under the neighboring cat where Houa has set up his woodshop. In fact, a lot of what they were doing was removing the balsa they had exposed in the cockpit. After lunch we spent some time in the cockpit with Golf, Max and Boy, analyzing, grinding, digging, chiseling and poking at the walls and floor. We had to decide how far back to take things (ultimately, the soft balsa determines the extent of the de‑construction), and what the next steps need to be. Once again, the Wauquiez factory workers took the quick and dirty approach, and bolted the heavy helm seat straight down through the balsa core. Water trickled in over 16 years and Voila! Rotten balsa. We cringe to think how the older 11 Kronos cats are doing. Thank goodness Jon had the foresight to want to peel off the teak decks! And thank goodness we included the cockpit area even though the teak was not nearly so worn out as the teak out on the deck in the sun. Houa, meanwhile is moving along with repairing damaged teak and holly floor boards, building whole new sections where needed, using Thai teak and pale ash wood in place of holly. He is quite the craftsman! We now have two other workers in the woodshop, young Ben and mustached Baw, who have been adding coats of varnish to the floor boards and prepping to put the first coasts of polyurethane (with thinners) onto the second batch of floorboards. Months ago, Golf had talked about doing all the varnishing at his workshop, some 3 miles (5 km) away, but it seems to be working OK here in the yard, and we're sure that it's more convenient to have all the workers in one location where Golf can manage them easily. Our neighbor, Rackam, is still under a makeshift tent, which the French call a "chapiteau" which sounds sort of like French "chapeau" or hat, but in fact means "circus tent". Connotation intended. They are due for their final paint layer soon, although it seems like a long time coming. 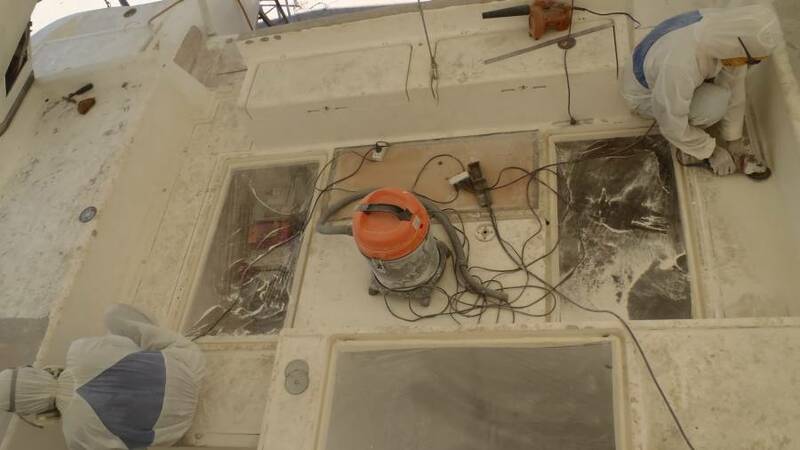 The other French cat, a Lagoon 47' named Lady Anne, is due to splash on Saturday, but today they were still putting epoxy mud on the bottom where there were lots of osmosis blisters. 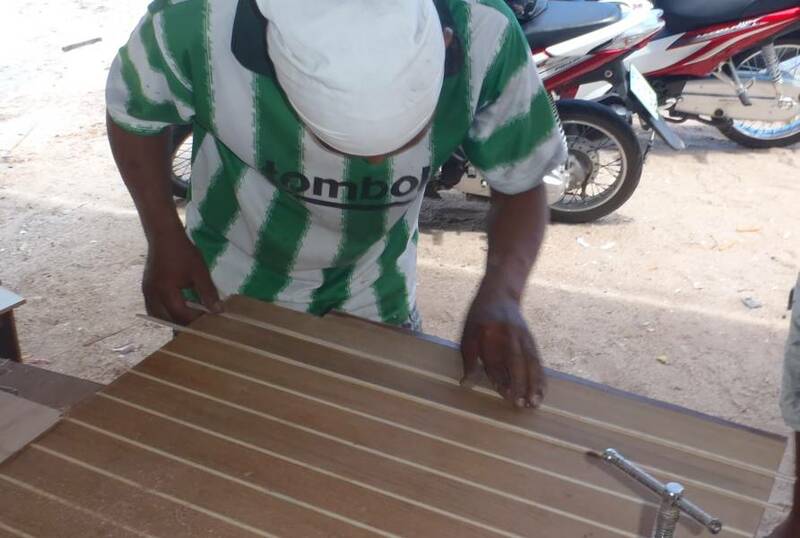 Work on these cats is under the direction of Bee Bee (not sure how he spells his name) who, according to Golf, is more a carpenter than painter, but he's a cheerful soul and seems to keep his workers busy and his clients happy! A few days ago we were looking forward to seeing some progress on the hatches on the side decks, but all of that has been put on hold while the grinding continues in the cockpit and aft deck. The good thing is that lots of woodwork is moving along. 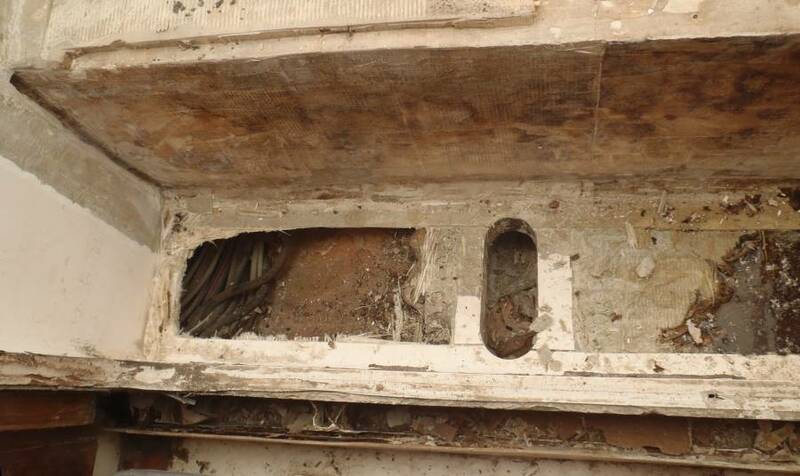 The inside of the boat is an ecological/health disaster with all the fiberglass dust that has crept in. No one will be working in there until the guys attack with vacuums and hopefully some sort of damp wipe down. At 7:30 this evening we walked a few kilometers towards Phuket Town to the local Wat (Thai Buddhist temple) to see the Makha Bucha Day procession. This ceremony takes place throughout the Buddhist world, and in Thailand takes place on the full moon of the third lunar month. 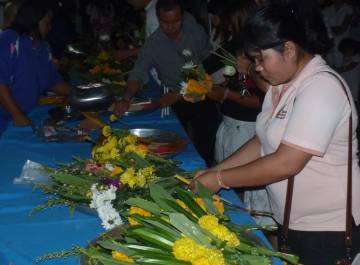 Makha is the name of the third lunar month, and Bucha means "to venerate." It commemorates a day when 1,250 monks, all from different places and on their on initiative, spontaneously came to pay homage to the historical Buddha. At our local Wat, hundreds of participants were seated in prayer in the temple, while more than twice that many waited outside in seats or on the steps of the shrines. A few food carts were there as well, including our "drinks Lady" who comes to the yard everyday. Participants all carried a small bouquet of flowers, some incense, and a candle. For about an hour inside the wat the orange robed monks and white robed nuns chanted. There was some responsive prayer as well, then the monks rose as a group and began to circle the Wat. The people all lit their incense and candles and walked as well, circling the temple 3 times in honor of the order of monks and the Three Jewels: the Buddha, the Dharma and the Sangha. The Thai processions are called Wian Tian. A short day at the boatyard for us today, as we had to go to Phuket Town to extend our 2 month Thai visas for the allotted extra 30 days. While we were in there, we also filed for permission to keep Ocelot in Thailand for another 6 months. Not that we hope to still BE here in six months, but it's best to request the maximum time. We started heading into town on a rental motorbike from Nina's Cars, just around the corner from where we're staying, but we decided to stop at the yard first. Just as we got there the heavens opened. Morning rain? In March? Golf said it was likely to last all day (which was true) and very kindly loaned us his boom‑box blue truck to take to town. While we were in town, the guys prepared to lay down 2 sheets of foam in the cockpit. So the main work in the afternoon was laying the mud, glass and structural foam into the two side cockpit areas. Golf, Boy and Max work really well together and it all went fairly smoothly. Golf's wife Mai was standing by, latex gloves on hands, ready to help hand the epoxy pans back and forth. The only hiccup was that the water jugs that we use to weigh down the foam so it bonds securely were no longer full of water, so Jon had to quickly borrow a hose from a neighboring boat and then shuffle the jugs around until they were all full. It will be very nice when the cockpit floor is back together so we can move around easily again. We just hope the rainy day doesn't effect the curing of the epoxy. Golf said that it doesn't matter as much with the epoxy mud, but it might if we were laying glass. Eventually the cockpit will be covered again with teak but just glued down, not screwed down! 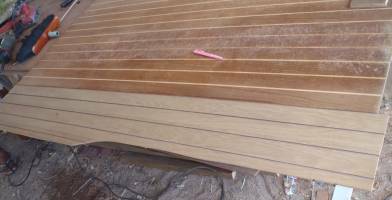 When Ocelot was built 16 years ago, teak decks were both screwed and glued down, but all those screw holes are what let the water get into the balsa core of the decks and cause all these problems. These days, teak decks are only glued down. 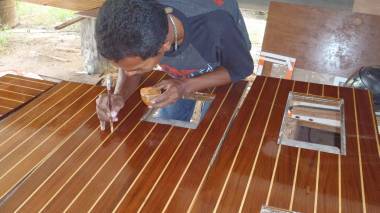 But that also means that the decks themselves have to quite strong, and not depend on the strength of the teak. Under the catamaran next to us, in our makeshift woodshop, Houa was busy rebuilding the damaged teak and holly floor which he'd started yesterday. Ben was wet sanding the floorboards so we guess the high humidity on this rainy day wasn't too much of a hindrance. Baw was the artist of the day, mixing powdered colors into polyurethane and color-touching the floor boards to hide small blemishes. We had never seen this done before but it looks quite good. Tomorrow, weather permitting, we hope to see the foam layers that we put down in the cockpit today get covered in a couple layers of fiberglass. We have 2 additional pieces of exposed foam - one under where the cockpit table will go and the other behind the cockpit. We worry that the foam on these is getting so dirty that the fiberglass won't stick to them properly. Best to cover the foam as soon as possible. Then more work needs to continue finding the places with wet balsa and opening them up. Now that we know what to look for, we've already found 4 more small areas that need to be opened up. We are really looking forward to the day when we can say "That's it! No more wet balsa!" Another excellent day! This morning when we got to the boatyard the workers were all hard at work, but Golf was absent. The woodworkers all knew what to do but Jon told Max and Boy that we want to glass in the foam that we'd laid yesterday. 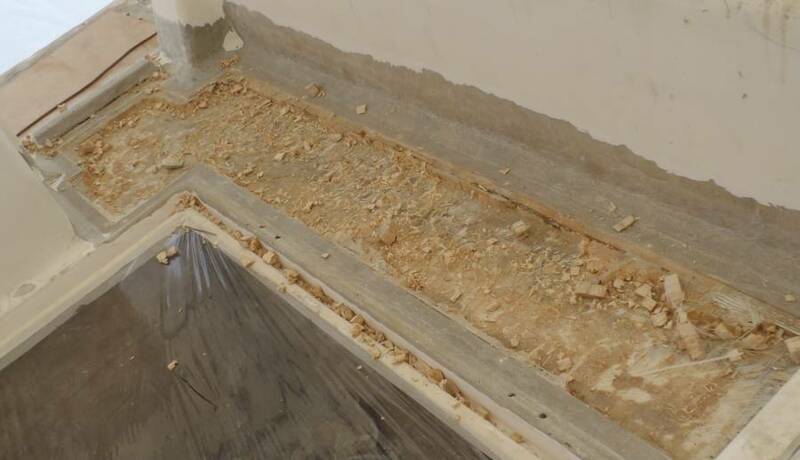 So fiberglass had to be cut and the foam had to be prepared, grinding down the the edges of the existing fiberglass so the glass we lay has something to grab onto, with minimal kinks. So Boy got suited up and started grinding while Max took measurements and cut the glass. The plan is to cover the foam with 2 sheets of biaxial glass now, then cover that with epoxy mud and fair it smooth before putting on the final 2 layers of glass. 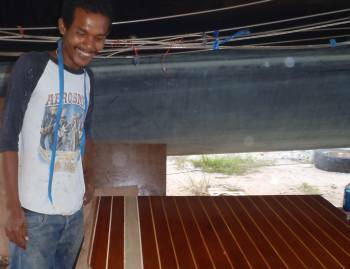 Then some finishing work and we can bring in the woodworkers to lay the teak. In the woodshop, Houa was working on the big floorboard right at our entryway. This board takes the most abuse - all the traffic in and out, as well as any water that splashes in through the companionway. He's rebuilding a strip along the right side, which will include 4 strips of ash (the Thai equivalent of holly, which apparently isn't available here). When he's finished, we've asked that it get a coat of epoxy before they start putting on the varnish. This should make it much more water and abuse resistant. Elsewhere in the "woodshop" the varnish guys were sanding some varnished floorboards before putting on the next coat. 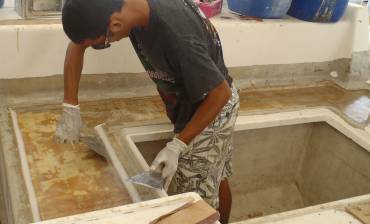 They're now using 600 grit sandpaper and water, to make the surface as smooth as possible. During lunch we noticed that the wind was no longer blowing from the water, but was coming from behind us. Then a couple of squalls passed us by to the north, bringing a few sprinkles. 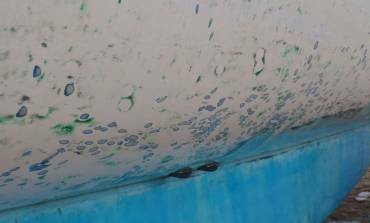 We were a bit concerned as we don't like to do epoxy work when there's too much moisture around, but soon the clouds dispersed, bringing heat and muggy humidity. Our lunchtime entertainment was watching a big Lagoon 44' being launched, and a smaller catamaran, Ultimate Dream with friends Richard and Susannah, getting hauled out. After lunch we got ready to lay our fiberglass. Golf had arrived but left again to attend his daughter's school event, so we were on our own. 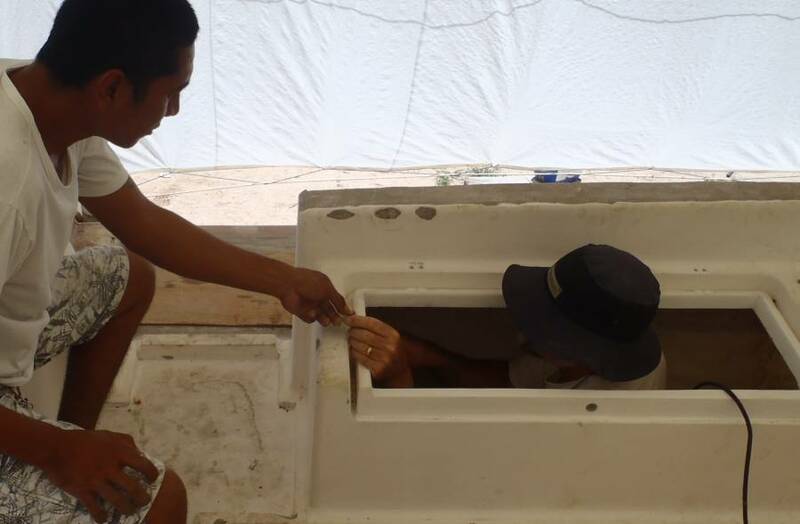 We'd thought Golf's lieutenant, E‑U, would come over to help but when he didn't, Jon gloved up and helped Max lay the glass while Boy mixed the epoxy for us. It all went very smoothly and we soon had 2 layers of biaxial glass on both of the areas that we'd foamed yesterday, one on each side of the cockpit. Then we realized that Max had cut the glass to cover the area under where the cockpit table goes, and the guys were expecting to glass that area as well. OK, lets keep the ball rolling. Problem was that we needed to cut the 2 big holes that the cockpit table legs go through, and also reinforce the area where the bolts go. So Jon dived into one of the cockpit lockers with a hand drill and drilled a ring of holes where one of the legs would go, as well as holes to mark where the bolts will go. Then, using the holes as guides, he cut the big circle out with a jigsaw, while Boy drilled the holes to mark the other leg. After cutting out the big circles for the legs, we cut out the foam where the bolts will go, so they can be filled with reinforcing epoxy mud. Then we laid a bit of masking tape around the inner edge of the hole, to keep the mud from sagging into the hole. Soon all was ready, so Max and Boy quickly laid down 2 more sheets of glass. The only fly in the ointment was that the epoxy mud started kicking off too soon. We considered pulling the (still wet) glass off and digging out the mud, but that area isn't all that critical. So we simply covered the 2 mudded areas with polyethylene sheeting and put a water jug on each to keep them flat (when epoxy mud goes off too fast, it tends to bulge up, and we didn't want it to push the glass up as well). So we're not quite 3 sheets to the wind - more like 2 sheets (of fiberglass) but laid in 3 places. 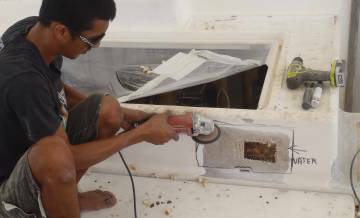 In the morning the guys sanded the glass that we laid yesterday, preparing it for the fairing compound that we'll lay down before the final 2 coats of fiberglass. Then we decided to do a bit of exploratory surgery, grinding through and peeling off some of Ocelot's skin where we can tell that it's delaminated from the coring. We've been putting it off, but it will probably be better to know the extent of things. Several years ago we had a bit of an ant infestation. 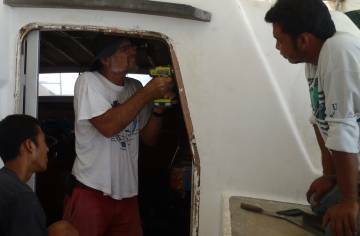 We eventually tracked them down to a tiny hole in the battery compartment, under the helm seat. We waged chemical warfare, hosing their entryway down in noxious chemicals until they were all dead, and we haven't seen any signs of them since. But we never knew what trouble they'd gotten into before we got them, and now we're finding out. We took the skin off the wall on that side of the battery compartment and found that the balsa inside wasn't so much wet as ... eaten away! No signs of living bugs, but not much balsa left either. We traced them down to the entryway steps and eventually made the decision to remove the main door on the companionway. We found some rotten (previously wet?) 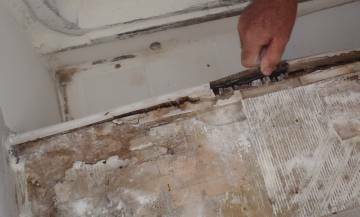 wood underneath the door, but that should be easy to replace with inorganic foam and epoxy mud. We still have more investigating to do, but we think (hope) we're getting to the end of it. Since the guys weren't grinding, Jon took the opportunity to drill out some mounting‑bolt holes. The Wauquiez factory didn't seem to reinforce any of the places where they drilled through the coring material, so we're wanting to retro‑fit that reinforcing. Jon used to use a hole‑saw to see what's under the winches and other bits of deck hardware we have bolted to the top of the cabin. 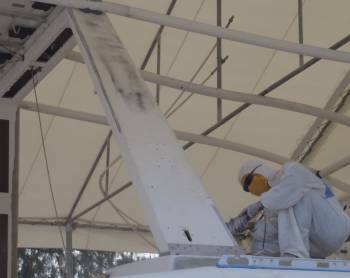 With the headliner off, he could do this investigation from underneath, leaving the decks unscathed, and we won't have to do any cosmetic repairs at all. 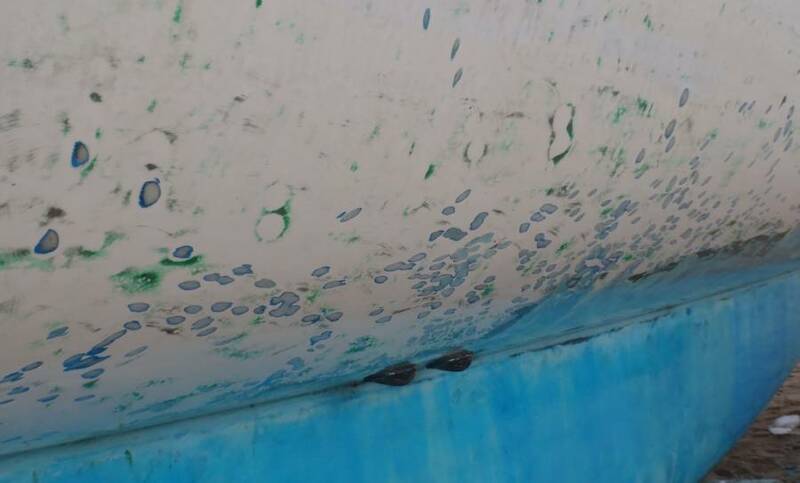 Once the holes are drilled out from underneath we can fill the holes with epoxy‑mud, put a few layers of fiberglass over (actually under) the mud to keep it in place. 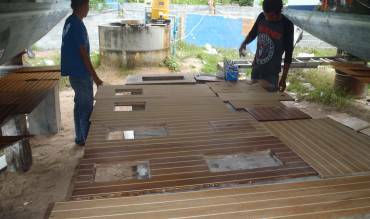 Once the epoxy is hard we can re‑drill the holes and remount the deck hardware. 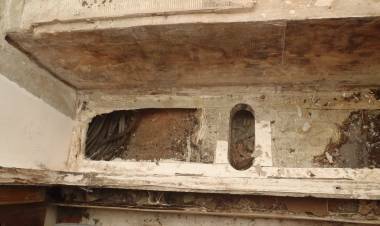 We found that some of the cabin‑top is cored in balsa, and some in high‑density foam. This was a somewhat unexpected but welcome discovery, as foam is much less susceptible to water‑damage than balsa is. Happily, none of the cores we took out showed any signs of letting water in at all, despite only being sealed with silicone. 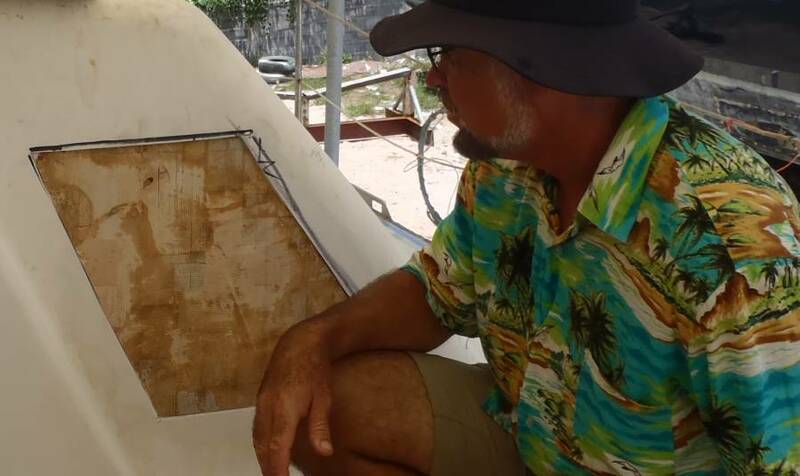 We have 10 holes for the spin‑locks, 22 for the 4 winches, 2 for a turning block, and maybe 3 dozen for each of the 2 jib sail‑tracks, or a total of about 100 holes to investigate. We'd thought that the fiberglass would be thinner on the underside, and it probably is, but it's still pretty thick. Fiberglass is pretty brutal to saw‑blades, and Jon has already ruined one of our 1¾" (45mm) hole‑saws, and he's only drilled out about 12 holes! In the woodshop, Houa has finished repairing our big floorboard that goes right at our entryway. The new teak and the ash aren't quite the same colors as the existing wood, but Baw is quite an artist with color and has been touching up the new wood so the colors match. We didn't think this was possible, but he's doing it! If you know which panels have been colored you can see it, but nobody who doesn't know will notice. Quite impressive! This patch wasn't glued down, but the balsa is fine. Glass it up! Sunday is the team's nominal day off, but they actually were all working today. We're not sure why. 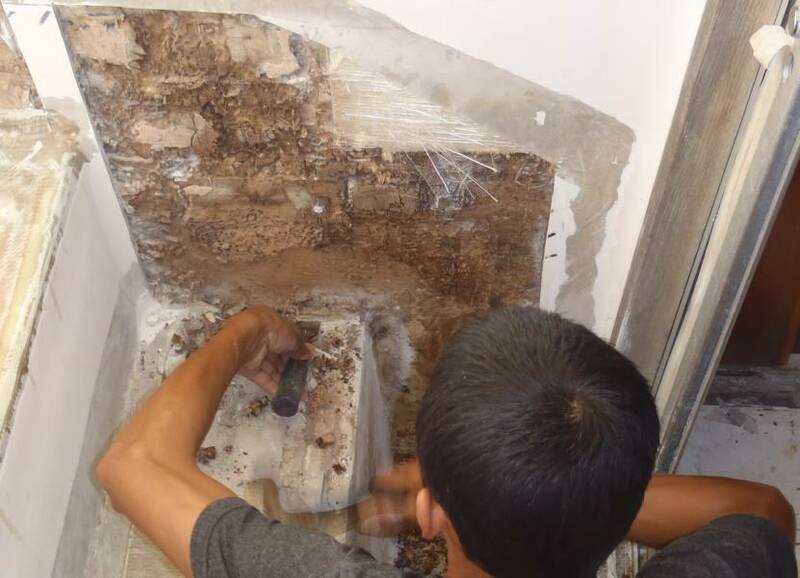 Usually more work is good, but today the guys were still doing exploratory surgery, and we like to be there for that, as sometimes they want to cut through places that they shouldn't. When we got to the yard this morning they'd already been at it for a few hours and discovered some interesting bits. An area outside the Nav‑station (starboard side of the companionway) wasn't bonded to the inner core, so they cut a panel out to find out why. Turns out that there was nothing at all wrong with the balsa underneath. It looked like the glue that the factory had spread on that wall had never contacted the balsa. That is, a factory defect that has been with us forever. But easy to repair. The guys will just fair back the fiberglass around where they'd cut out the panel, and we'll epoxy in several sheets of biaxial glass, making sure that the epoxy and glass are well adhered to the balsa. Over by the companionway, things weren't so pretty. The guys are still finding evidence of ants so they're cutting back more of the fiberglass. They also cut through an area under the teak grating at our entryway, because some of it sounded hollow. We found that this area was never built as a sandwich - it's just a sheet of fiberglass (which is why it sounded hollow). But on the port side they cut through to find a small lake of water! (Unfortunately, the spray from their cutting disk hitting the water got into their grinder and burned out the motor, so Golf will have to buy another one.) We're not sure how the water got in there so we'll have to track that down and provide a channel for it to drain overboard. But this may solve a mystery for us. We sometimes get a bit of water weeping into the guest cabin under the cabinets, at about knee level. We've never known where this water is coming from, and now we have a better idea. One thing we've noticed with all this surgical cutting - Ocelot's skin is much stronger and thicker than we thought. This is probably why we haven't had any structural problems despite these issues with our coring. Now that we're sorting out the coring issues, she should be even stronger.